Imagine a world where transnational corporations don’t have to follow the same laws as everyone else, but instead have their own corporate courts, where the law is tailored to their interests. Not courts where the companies are put on trial, but where corporations sue governments for huge sums of money and bully countries to get their own way. It sounds like dystopian science fiction, but corporate courts are real. Formally known as investor state dispute settlement (ISDS), these special privileges are granted to transnational companies by rules in trade and investment deals. 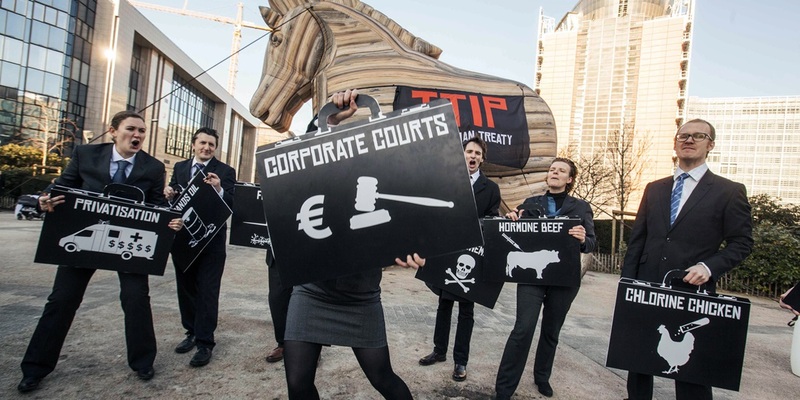 These corporate courts are written into thousands of trade and investment deals around the world. But the global fightback has started. Across the world, countries have been rejecting ISDS: South Africa, India, Ecuador, Tanzania, Indonesia and New Zealand have all taken steps to review, limit or terminate existing ISDS deals and refuse to sign new ones. At the same time, the movement against TTIP and CETA – the EU’s trade deals with the USA and Canada – has exposed its illegitimacy. The system is vulnerable. Campaigners all across Europe are gearing up to create an unstoppable momentum for change in our own countries. We’re at a tipping point, and if enough of us come together, we could bring ISDS down altogether. Removal of ISDS in existing investment deals. Sign the petition and join the movement to end corporate courts.